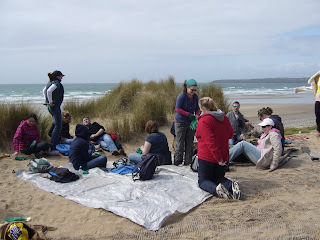 Photos from IWT/AOL Volunteer day on May 7th at Tramore Sand Dunes. 25 conservation enthusiasts took to the dunes at 9 am yesterday morning to try to stabilise the dunes, which are under threat from weather, ocean, trampling, quadbiking etc. 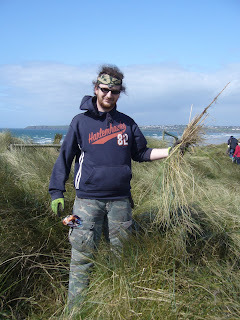 They came fromn Waterford-based company, AOL and along with Irish Wildlife Trust members and Education Officer Andrew, and Andy from Conservation Services (contractor working for Waterford County Council on this project) to transplant marram grass, lay protective mesh and clear up litter. 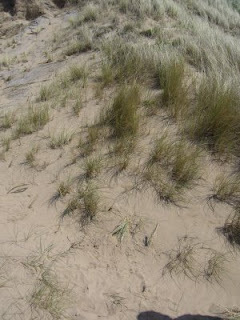 Blow-outs (areas without any grass or plants) are part of the process of erosion in which the exposed sand is vulnerable to the effects of wind etc, which can simply blow the dunes away, wiping out the homes of a large variety of insects, birds, mammals and plants which inhabit the area. And destroying a valuable amenity in this case. Marram Grass plays a key role in dune stabilisation, by "binding" the sand grains together, and by causing more sand to accumulate, leading to conditions which support other plant life and consequently, a stable dune. Mesh reduces the blow-off in exposed areas of sand. Tramore Dunes are part of an SAC (Special Area of Conservation # 000671. see www.npws.ie for more information) and need intervention if they are to survive in the present form. The area has been fenced off to allow the grass to regenerate. You can see that it was a sunny bluesky day and really great fun - what you can't see in the photos was the million grains of sand that got into hair, ears, noses, the kelley-kettle.... The wind was almost overpowering - litterpickers almost turned into kitesurfers over the Baldy Man when wind got into sacks! But this was a determined and hardy group of people who stuck at the task till 4pm and great progress could be seen when we finally loaded up the tools and headed for home. Bernie Guest, Waterford County Heritage Officer afterwards expressed her appreciation for the work to all involved. We wouldn't like to see all the work wasted, so we're calling for everyone who goes there to respect the dunes, the fencing, avoid walking and report quadbiking (which is illegal) to Gardai (051 391620), Waterford County Council (051 39555) or The Wildlife Ranger (087 8541961). In Killarney Woods, clearing Rhodedendron - 1 week June, July or August (www.groundwork.ie or www.iwt.ie) or on Clare Island, clearing Gunnera - 2 weeks - last week August and 1st week September. Thanks to Sandra, from Dublin's Volunteer Group - the Grubby Gang - for these photos.